Canon grows its PRO series of professional large-format inkjet printers with the introduction of the imagePROGRAF PRO-6000. 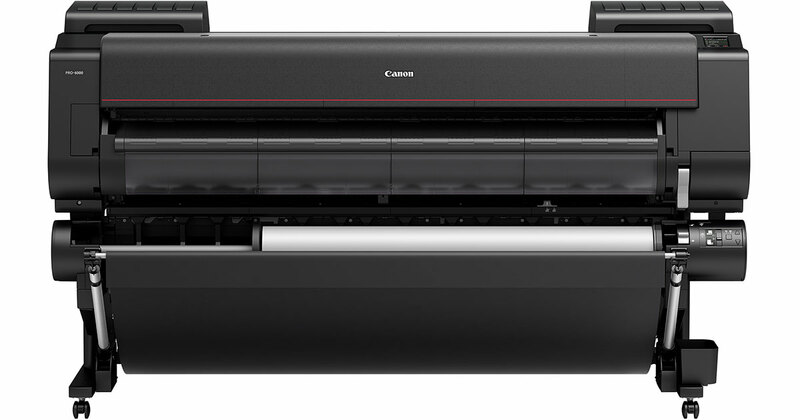 Capable of making fine-art prints at a 60-inch width, the unit represents the largest 12-ink printer available today. The imagePROGRAF PRO series printers now range from 17 to 60 inches. The Canon imagePROGRAF PRO-6000 printer is scheduled for August 2017 availability at a price of $11,995. Typically an option for smaller sized models, a Multifunction Roll System (MFR) comes standard with this 60-inch model to allow for increased versatility. When used as a second roll, the MFR system enables users to load glossy media in one roll and matte media in the other to seamlessly print to both rolls without needing to The Multifunction Roll unit will intelligently switch to the correct media, automating the process and providing increased ease of use. The roll can also act as a take-up unit with bi-directional rewind, ideal for long, uninterrupted print runs. Canon U.S.A., Inc., is a leading provider of consumer, business-to-business, and industrial digital imaging solutions to the United States and to Latin America and the Caribbean markets. With approximately $29 billion in global revenue, its parent company, Canon Inc. (NYSE:CAJ), ranks third overall in U.S. patents granted in 2016.† Canon U.S.A. is committed to the highest level of customer satisfaction and loyalty, providing 100 percent U.S.-based consumer service and support for all of the products it distributes in the United States. Canon U.S.A. is dedicated to its Kyosei philosophy of social and environmental responsibility. In 2014, the Canon Americas Headquarters secured LEED® Gold certification, a recognition for the design, construction, operations and maintenance of high-performance green buildings. To keep apprised of the latest news from Canon U.S.A., sign up for the Company’s RSS news feed by visiting www.usa.canon.com/rss and follow us on Twitter @CanonUSA. For media inquiries, please contact [email protected]. 1 Adobe® Photoshop® and Adobe Lightroom® software must be purchased separately.